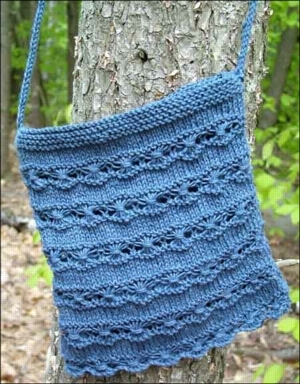 Here is a wonderful knitting pattern from the good people at Unique One in Camden, Maine. They have a very nice hemp section in the store, complete with Vote Hemp brochures in the display. Unique One also donates their leftover packing peanuts for Vote Hemp to use in shipping their donation gifts. This pattern comes from their current newsletter and is reproduced here with permission. Yarn: AllHemp6, by Hemp for Knitting (DK weight; 150 yards/3.2 oz. skein) - 2 skeins. The model was made in color 30, periwinkle. Needles: sizes 3 and 5 single point; 2 size 3 double pointed needles for the i-cord strap. Gauge: 5 sts = 1 in. in st.st. triple yo: insert right needle into next st, wrap yarn around needle 3 times, complete knitting the stitch. cluster st: with yarn in front, [sl next st, dropping extra 2 yo's] 5 times, [bring yarn to back between needles, sl 5 sts back to left needle, bring yarn to front between needles, sl 5 sts to right needle] twice. i-cord: cast sts onto double pointed needle; knit them; slide all stitches to right side of the needle and knit them again, pulling the yarn around to the beginning of the row. Row 1 (right side): K1, *[triple yo] 5 times, K1; rep from * to end. Row 2: K1, *work cluster st over 5 sts, k1; rep from * to end. Rows 4, 5, & 7: Knit. Rows 6 & 8: Purl. Rows 9 & 10: Knit. Row 11: K4, *[triple yo] 5 times, K1; rep from *, end K3. Row 12: K4, *work cluster st over 5 sts, k1; rep from *, end K3. Rows 13, 14, 15, & 17: Knit. Rows 16 & 18: Purl. Rows 19 & 20: Knit. With larger needles, cast on 49 sts. Work the 20 rows of the Daisy Chain pattern three times (total of 60 rows). Switch to smaller needles and knit 4 rows. Bind off. Make another piece in exactly the same manner. With right sides together, sew the sides of the bag together. Turn bag inside out and sew across the bottom of the bag just above the scalloped bottom edge formed by the Daisy Chain Pattern. Create lining, if desired, and sew into bag. Make i-cord strap: Using size 3 double pointed needles, cast on 4 sts and work i-cord for 48 inches. Sew each end of the strap to sides of bag at the top. • Try knitting the textured-stitch rows in an alternate color for a different look. • Lining the bag is optional - but the "daisy" chain holes will allow small objects to fall out if the bag is unlined. Today is one of my son's birthday. 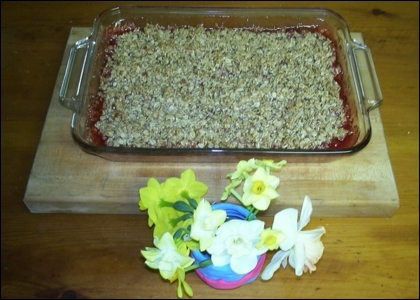 He has been asking for me to make him a strawberry rhubarb crisp. Since our rhubarb plants are producing quite nicely this year and today is his birthday I though that he would love it for breakfast. Mom sent him out to cut some rhubarb while I did some quick recipe development. While I was making it he asked that half of the nuts be shelled hemp seed instead, so I sent him and one of his brothers down cellar to get the five pound bag of Nutiva shelled hemp seed I just received. It turned out quite nicely, but a tad sweet. I reduced the sugar by 1/4 cup for this recipe. This has been one of those weeks that hemp supporters dream about! The North Dakota Department of Agriculture issued a News Release on proposed rules for the production of industrial hemp in that state. Agriculture Commissioner Roger Johnson has scheduled a public hearing for 10 a.m., June 15, 2006 in Lecture Room B in the North Dakota Heritage Center in Bismarck, ND. Farmers in North Dakota won't be joining their Canadian counterparts in planting hemp this spring, but perhaps they will in the near future. Vote Hemp issued a Press Release on this subject as well. As you can imagine, most of the week's hemp news was in response to these two press releases. Two of the stories were by James MacPherson of The Associated Press. One story was "N.D. Pushing Ahead With Hemp Farming Rules" the other "State's first hemp farming rules aimed at clearing federal hurdle". It is an interesting exercise to compare and contrast the two stories. The quote by DEA special agent Steve Robertson "It's very simple for us: The law is there and we enforce the law. We are law enforcement, not lawmakers." is technically accurate, but DEA does have pretty wide latitude in creating rules. It would be possible for DEA to create rules under existing law that would accommodate hemp farming. Jon Gettman mentioned the possibility of negotiated rules in the story "Plan B: a new option for breaking the impasse on US hemp policy" in Hemp Times, Spring 2000. H.R 3037 Industrial Hemp Farming Act of 2005 could pass as well. Who knows how this will all turn out for those of you in the States. Also interesting was the fact that the story about the proposed hemp farming rules in North Dakota was also mentioned in ag publications like Agriculture Online and Agri News as well in small blurbs in the farm sections of papers like the York Dispatch. Please be sure to vote in the poll in the story ND AGRICULTURE: Plan would allow hemp which was the best of the bunch. There were also stories about the possibility of hemp legislation in the state of Wisconsin, very interesting to see all of the law enforcement objections to industrial hemp and the Wisconsin players mentioned all in one place. Another on the sixth annual Hemp Hoe Downsixth annual Hemp Hoe Down, at the Elk View Campground near Piedmont, South Dakota starting this Friday, May 12th. More information is available at the Hemp Hoe Down web site. And lastly one on hemp clothing, the newest trend in fashion.